Another spring, another Ip-art, the town's annual arts festival. This time around there's a short story competition: max 500 words on the theme of "Coast", open to whatever interpretation you like. Thought bubble: I could do that. Reads on a tad more to find out that entries are due by Saturday of that week, Cup Final day. Thinks: I can still do that. Ideas come, days go by, and waddya know, it's Friday evening with nowt to submit. Not to worry. Fires up trusty iBook around 10pm and proceeds to bang out a tale of sorts, fleshing out the poorly handwritten notes from a 5x3 index card. Cafetiere, water, darjeeling, and so to bed at 3am. Can print it tomorrow, change whatever and cycle it to town to hand in. Which I do, abandoning the abysmal Chelsea/ManU showdown. Pleased to have simply entered. Month later and a letter from the organisers, thanking me for my entry blah blah standard very high blah blah selected for the short list. What was that last bit again? Woo-hoo! Free ticket enclosed for lit event -- two proper writers in attendance -- when the winner will be announced. Whizz back from work, pull on Molesworth T-shirt, whizz to Town Hall. Writers are Alison Macleod and DJ Taylor, and there's some good chat about, er, writing stuff. Half-time drinks and I spot a friend: her friend has also been shortlisted, so we congratulate each other and joke that you just had to enter to get on the list. Seconds away, the kids prizewinners are announced, bless 'em, and the writers comment on the dozen stories which made the short list. Excerpts from the top twelve are impressive -- ideas like pebbles, writing the landscape, etc. -- though not a squeak from mine which is surely making up the numbers. Runner up's entry is discussed, and we warmly applaud Mary (?) as she steps forward. DJT goes on to talk about aspects of the winning story, a dark little number: a man, a coffee shop, his children. At which point the room begins to swim a little and I focus on not passing out. 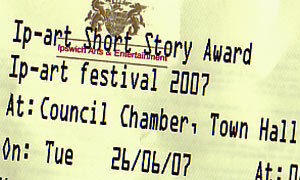 And the winner of the Ip-art Short Story Competition for 2007 is ... Ed Broom. Would you like to come up to the microphone and read it out? Like I say, surreal. If you're up for it, read it.